Regular users of the crossings and cycle hire below the Marylebone Flyover will have noticed a new piece of public art appear in April. ‘Forest under the Flyover’ was produced by Manou Bendon following a commission by Transport for London (TfL) who own the structure. Marble Arch London has been working with TfL and Westminster City Council for over two years to devise projects aimed at brightening up the space below the flyover, with a range of public art and up-lighting ideas considered since 2013. The first of its kind carried out on a TfL structure the project uses the concept of reverse graffiti and literally cleans the image out of the dirty surface. To create a high contrast for the artwork the flyover’s underside was slightly darkened using homemade natural milk paint; Casein from milk was combined with water and ground charcoal to produce this, mimicking the colour created from the exhaust fumes of the traffic. “The tree images are intended to work on a number of levels. The shape of the bridge lends itself to the idea of roots, like the trunks of trees they support a greater whole. In turn, when I first visited the site the darkness and cavernous spaces under the bridge felt like walking through a forest. The tree images also seek to connect people to the materials of the bridge, if you look carefully you can see imprints of wood in the concrete – this is a reminder of the processes that create city spaces – the materials are produced and built to make a final whole – I wanted to reconnect people with the natural world from which cities are born” said Manou Bendon. A total of 31 stencils were laser cut on a material called Mylar. This allowed Manou’s team to work with the bending overhang of the bridge. 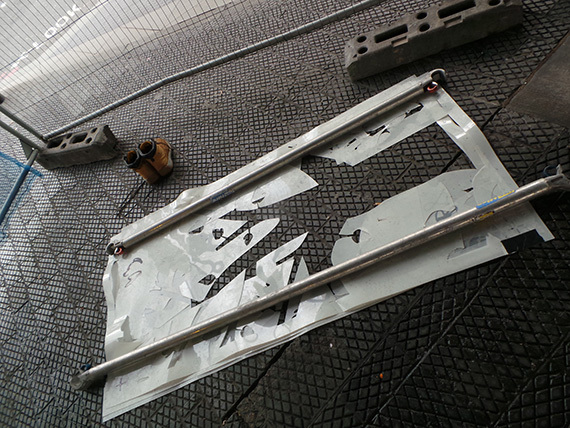 Each stencil measured 950mm x 1,800mm. 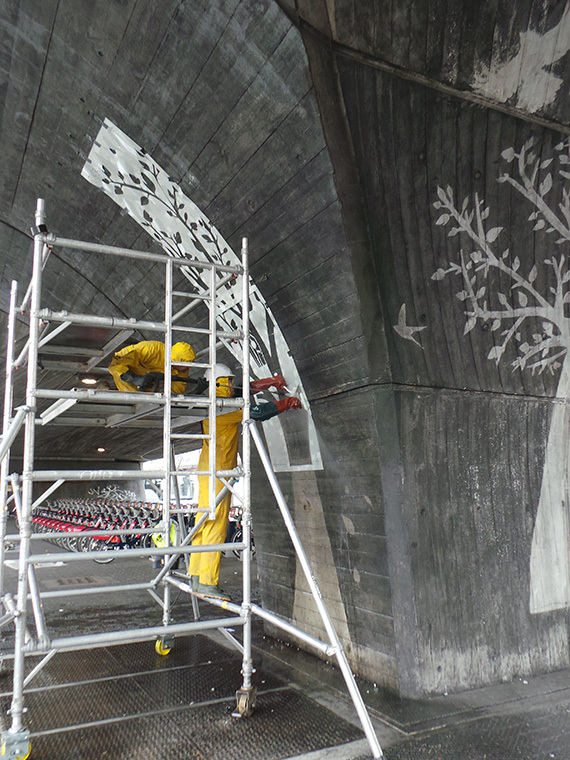 Each tree face used around 34.2m2 of stencils. 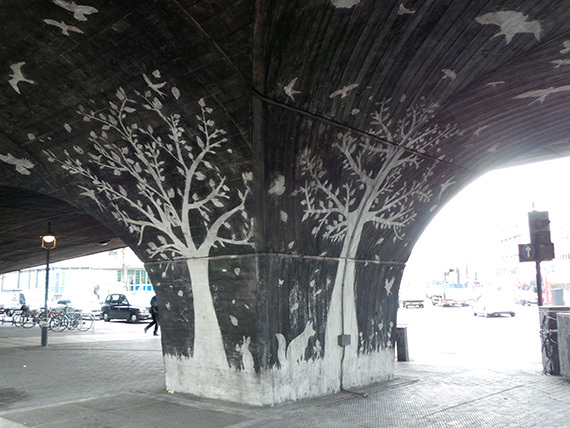 The trees had to be pieced together like a giant puzzle, covering 273m2 of the flyover’s underside. 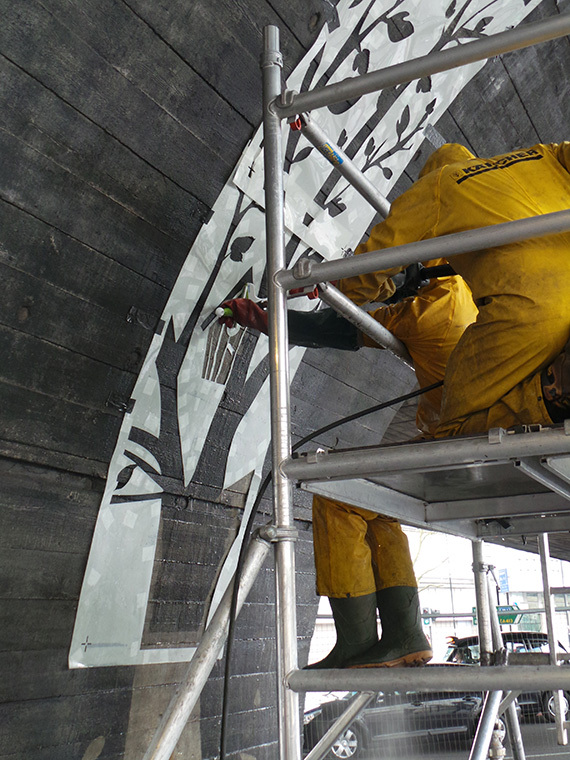 The installation of the artwork took 19 days to complete, with three or four people on site every day, working at height, managing stencils in high winds and using a pressure washer at very close range. Forest under the Flyover completed. One of the stencils used to create the artwork. The team in action pressure washing.